December: Introduced at Ryan Renshaw Gallery, Brisbane in a curated exhibition before exhibiting in Melbourne early 2007. Exhibited in QPAC's Installation Space, 'The Window' . 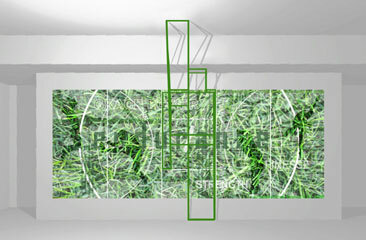 Dimensions 2 metre x 2 metre x 2 metre. A combination of lighting and parallel strips of translucent material layer, reduce and define an elemental geometric shape. I use refracted light to distort and change what can be seen from each angle, but denying complete visual access. The illusion is designed to make the viewer want to enter the space to see more - replicating the scientific aspiration for new knowledge. This Installation forms part of my ongoing response to data supplied by The Queensland Brain Institute and forms the first part of the Cross Sections Project supported by the Visual Arts/Craft Board of the Australia Council.